I would be shocked if anyone was not familiar with the story of US Airways Flight 1549, which made worldwide news on January 15, 2009, when after takeoff from New York City’s LaGuardia Airport, struck a flock of Canada Geese just northeast of the George Washington Bridge; consequently losing all engine power. 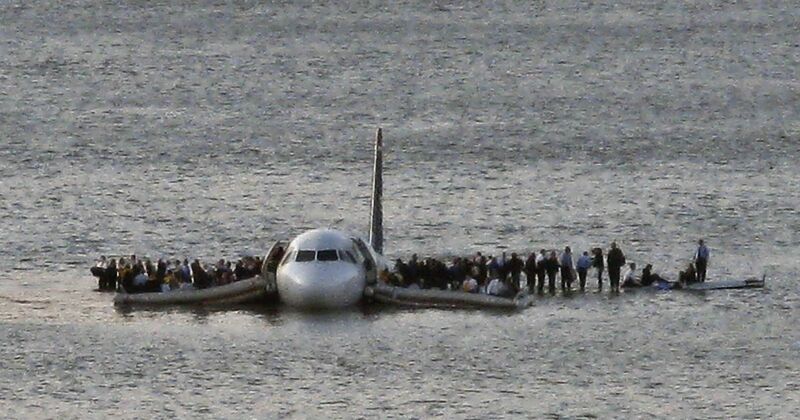 Captain Chesley Sullenberger, who was portrayed by Tom Hanks in the movie Sully, was hailed for the remarkable landing that became known as the Miracle on the Hudson. What some of you, however, may not be aware of, is that Dave Sanderson was the last passenger off the plane on that fateful day. In fact, Dave was largely responsible for the well-being and safety of others, risking his own life in frigid water to help other passengers off the plane. Once upon a time in what may now feel like a lifetime ago for Dave Sanderson, Dave was instrumental in his former role as Tony Robbins security detail. Dave spent many a day and many an evening with his security team overseeing his friend, colleague and mentor, Tony Robbins himself as well as Anthony Robbins Companies as a whole. A common mission within their interwoven paths, more than prepared and inspired Dave to “make the move” to live his own dream in helping others to realize their own potential. Following Dave’s #MiracleOnTheHudson transformational, life-altering moment, Tony lovingly and respectfully kicked Dave out of the Robbins nest, telling him to go fly on his own given that the Universe had gifted Dave with his own newfound direction and higher purpose. A gift bestowed upon Dave, unleashing his own message, on his own stage, in which to impart to the collective. Dave Sanderson’s message took flight at rocket speed, and has most definitely landed. Dave and I synergistically hit it off instantly while on the global airwaves together – so much so, that I invited him as my guest at a C-Suite Network Hero Club, Thought Summit in Toronto, Ontario. Introductions were made between Dave and CEO/Co-Founder, Jeffrey Hayzlett of the C-Suite Network (also interviewed on Living Fearlessly with Lisa McDonald) and as a result, Dave is now wearing a few additional hats in which to get his message out there across the globe. Dave went from being my gracious radio/podcast guest to now hosting his own show on the same platforms and networks where I too, am showcased. This awesome triad of co-creative synergies took Dave, Jeffrey, and myself to Orlando, Florida, for the Annual Podfest Event, whereby the three of us took the same stage as Panel Speakers. I personally and professionally feel immensely blessed and grateful for Dave’s pivotal presence in my life. His clarity and every day example of fully and authentically living in the here and now, has wholeheartedly made #MomentsMatter a resounding, impactful message, further resonating with me at a deeper; more profound level. For that alone, I will remain eternally grateful to you our friend! Although Dave is many things to many people and wears a plethora of hats in the paying it forward and being of service space – he will always be much more to me than a TedX, International Speaker, Trainer, Author, Mentor, or Podcaster – Dave Sanderson has become one of my most tangible Heroes, and in the ways that make my #MomentsMatter! Thank you, Dave, for the gracious gift of your time which you so generously shared with myself, the loyal listeners, and the Living Fearlessly with Lisa McDonald Podcast Subscribers! I appreciate you! Keep Shining our friend! Be your own Leader. Be your own Best Friend.